The Philippines' Rey Danseco has been named the “Judge of the Year” at the historic 50th Convention of the World Boxing Council at the Grand Oasis Hotel in Cancun, Mexico. The award was announced by WBC executive secretary Mauricio Sulaiman, son of WBC president Don Jose Sulaiman who has always told us how highly he thinks of Danseco’s performance as a judge. Danseco received a golden plate on stage before around 1,000 delegates from around the world including top promoters, manager and world champions past and present. Also present at the awards night were Games and Amusements Board chairman Monju Guanzon, GAB boxing division chief Dr. Nasser Cruz, Gabriel “Bebot” Elorde Jr and his wife Arlene and Johnny and Liza Elorde. 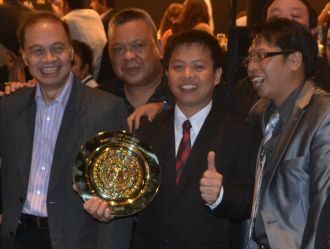 Danseco, who is also a TV commentator and journalist, said that after winning back-to-back awards as the “Boxing Judge of the Year” at the Annual Flash Elorde Banquet of Champions “this is the biggest honor and recognition and I will work hard to raise the dignity of the Filipinos and Asians” even as he dedicated his award to his country and his fellow Filipinos. 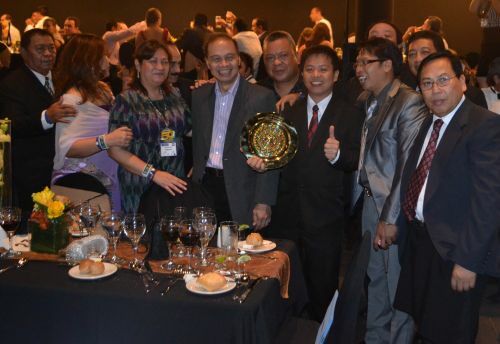 Filipino judge Rey Danseco proudly holds the golden plate after he was ajudged as the 'Judge of the Year' during the 50th WBC Convention in Cancun, Mexico. Danseco shares his victory with the Filipino delegates, from left to right, Johnny Elorde, Johnny's wife Liza, Bebot Elorde's wife Arlene, GAB Chairman Ramon Guanzon, Bebot Elorde and Aljoe Jaro.